Oak Knoll is introducing a new level of high-quality building and craftsmanship to the Oakland area. There’s a lot going on now that ground has been broken, so please check here often for the latest news coverage about this new community. 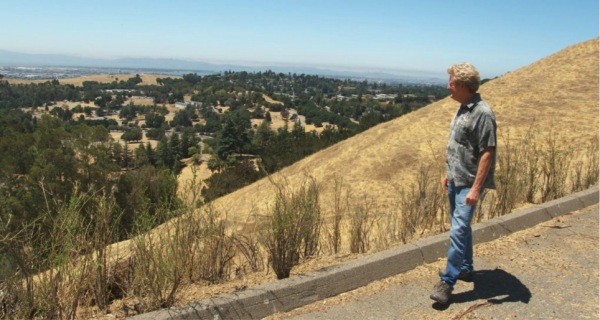 Sculptor Philip Dow walks through the site of the former Oak Knoll Navy Medical Center. He is coordinating developer SunCal’s effort to find local artists to work on projects for five locations in the planned community that is scheduled to break ground in early 2017. Photo courtesy of SunCal. Property developer SunCal is breaking new ground as it transforms the former Oak Knoll Naval Medical Center perched above Interstate 580 into one of the city’s largest developments — a community of 935 homes, 72,000 square feet of retail space and 76 acres of recreational space. The 187-acre site also will have five pieces of public art. In what is a rarity among developers in Oakland, SunCal is on board with a city requirement that 1 percent of a project’s cost be set aside for public art. “This is something that we should really embrace,” SunCal Senior Vice President David Soyka said in an interview. “It is our goal to engage the Bay Area art community to help us create a sense of place, a focal point and a destination,” he said. The company has charged local sculptor Philip Dow with soliciting bids from artists, setting aside $900,000 for artwork. “It’s exciting to give opportunities to local artists to participate in something like this,” Dow said. “It’s the first time public art will be used on a private development of this size,” he added. Three projects are reserved for Bay Area artists; the other two are open to all Californians. Dow describes the five sites in videos at www.oakknollcommunity.com/public-art. “We wanted to make sure local artists got a chance to apply,” SunCal spokesman Kevin Keane said. The Building Industry Association of the Bay Area, which represents 300 builders, contractors and suppliers, has sued Oakland over its public art ordinance. The lawsuit alleges the ordinance violates developers’ First Amendment rights by forcing them to pay for someone else’s speech — in this case, someone else’s art. One of the five Oak Knoll projects SunCal has designated for public art calls for six benches and six bike racks that, once they have met their utilitarian obligation, are open to whims of fantasy. Only Oakland residents are eligible to apply. Another project reserved for Bay Area artists is at the Rifle Range Creek Bridge. The third site reserved for Bay Area artists is the plaza at the proposed village center. The developer anticipates a piece either overhead or incorporated into the hardscape, the surface of the plaza, which could be terrazzo, designs in concrete, tile or perhaps embedded LED lighting, Dow said. “It’s going to be challenging because the area needs to be kept open,” Dow said, anticipating that the space would eventually be used for community events such as farmers markets. A woodland next to Rifle Range Creek has mature oaks. The hope is for environmental art that complements the oaks. This and the art sought for the 2.5-acre Creekside Entry Park are open to any California artists. The mandate is to draw inspiration from work done during the 50 years the hospital was in operation. Artists interested in applying for the work should visit the website. Although it is not expected that the public art will be installed until Oak Knoll nears completion in spring 2019, a selection panel will begin reviewing applications early next year. Three finalists for each project will be chosen and offered an honorarium to complete a proposal. SunCal has final say on which art project is chosen. The Navy left Oak Knoll in 1996. Since then, the site has had a long and difficult path. After acquiring the property at auction in 2006, SunCal’s partner in the planned project, Lehman Brothers, went belly-up in 2008. “When they disappeared, the property took many years to sort out,” Soyka said. SunCal acquired it from the Lehman estate in 2012, he said, and resumed the project. The hospital was razed, along with 500 other structures. Asbestos in the hospital building required abatement, and once that was done, “we still have to take care of the weeds,” Soyka said. To tackle that problem, the company has enlisted the help of some four-legged creatures to chew down the overgrowth. At the moment, “it’s pretty much dirt and goats.” Soyka said. Disclaimer / Privacy. © 2019 Oak Knoll Venture Acquisition LLC. All Rights Reserved.